Collectibles Authentication Guaranty® (CAG) has launched the CAG Artifact Registry™, a searchable online gallery of CAG-certified collectibles. It can be viewed at CAGcertified.com/Registry. The first collection to be featured in the CAG Artifact Registry is the Armstrong Family Collection™, thousands of artifacts saved by astronaut Neil Armstrong — the first man to walk on the moon — and his immediate family members. The Armstrong Family Collection has been entirely certified by CAG, and the first auction of nearly 1,000 items realized more than $5.2 million. With the launch of the CAG Artifact Registry, 956 items from the Armstrong Family Collection are initially included, and more will be added in the coming months. The items are displayed with descriptions and high-resolution images. The Armstrong Family Collection can be searched by keyword (such as "Boy Scouts," a group Armstrong had strong ties with) or by artifact type (such as flags, jewelry or coins). Two special search options allow users to filter to items that were flown in space and — in an even more prestigious subset — flown on the Apollo 11 Lunar Module. Two CAG-certified propeller pieces from the Wright Flyer, the famous Wright Brothers airplane, that sold for $275,000 each. 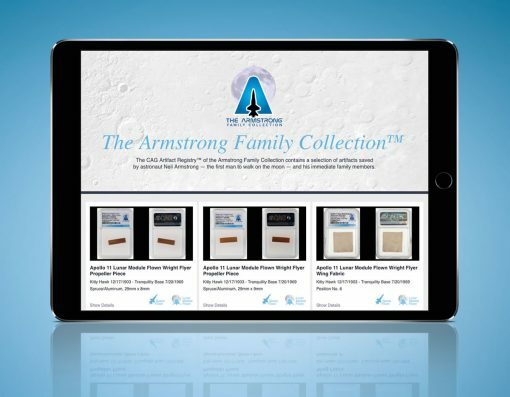 Additional CAG-certified artifacts from the Armstrong Family Collection are expected to be sold in spring 2019 before the 50th anniversary of the historic Apollo 11 moon landing mission. Images and descriptions for these items will be added to the CAG Artifact Registry soon. The Armstrong Family Collection was the first collection to be certified by CAG, an expert and impartial certification service that works directly with collectors, estates, artists and museums to preserve the authenticity and provenance of their artifacts, memorabilia and estate items. CAG is a member of the Certified Collectibles Group (CCG) of companies, whose members include the world’s leading certification services for coins, banknotes, comic books, magazines and stamps. The CCG companies have collectively certified more than 50 million collectibles since 1987. View the CAG Artifact Registry at CAGcertified.com/Registry.